An Airport Layover, ‘Keep It Up, David’ Style | Keep It Up, David! My recent flight to Detroit included a two-hour layover in San Francisco. My philosophy about layovers is this: I had just spent time (sometimes hours) on a cramped airplane, and I have more cramped airplane excitement ahead of me, so when I have time to kill in an airport during a layover, I want to stretch my long legs (I’m 6’4″) and move. I’m not talking about a sweaty, full-fledged workout. But since many airports are enormous, I take advantage of the space, and go walking. 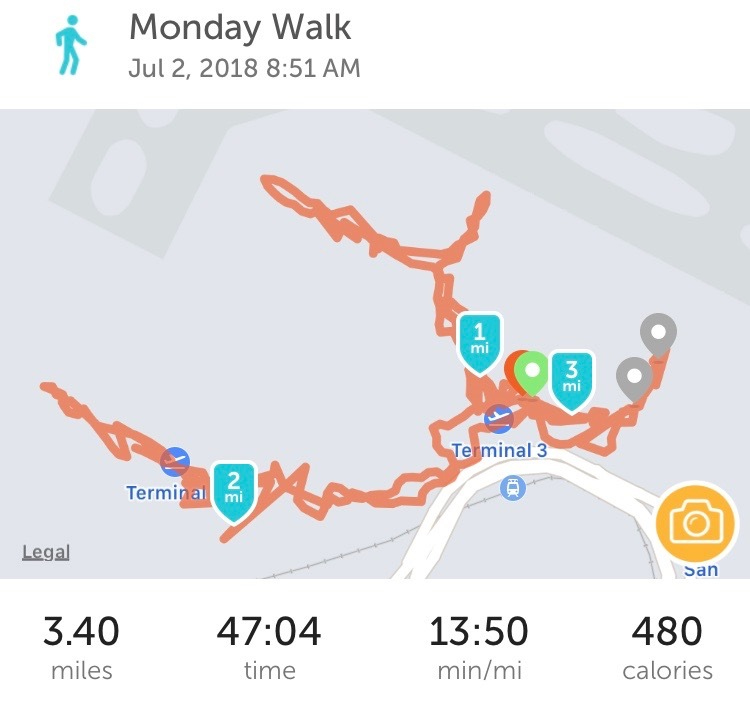 I just keep a moderate pace, because I often can’t go any faster, thanks to crowds, people wheeling around suitcases, kids that dash around, and so on. I skip all moving walkways and escalators, but, then again, I do that everywhere I can, at all times. In San Francisco, I explored a couple different terminals on my 47-minute walk. I was pleasantly surprised at how many cool big pieces of art there were, especially in the International Terminal. 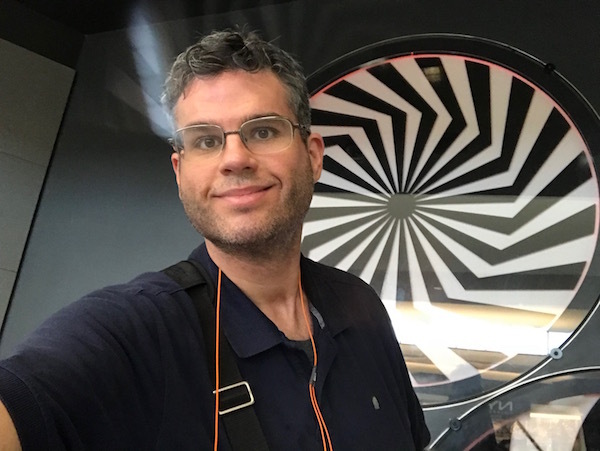 One of my favorites, in Terminal 3, was a collection of giant spinning pinwheels on the wall and floor. 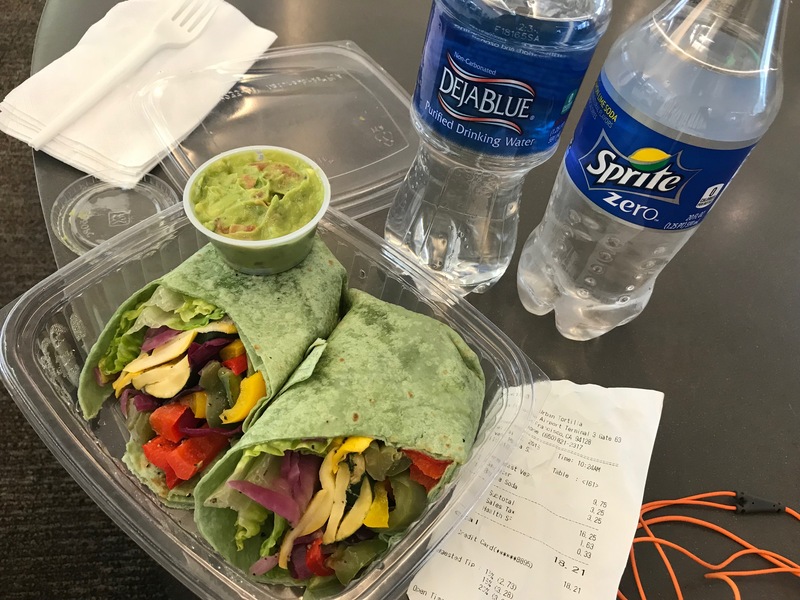 Finding healthy food in an airport can be a challenge – although I’ve noticed that it’s gotten easier over the past five years or so. By walking the entire length of a terminal (or two), I get to see all the food options available to me, and either pause my walk to eat, or go back at the end of the walk to get exactly what I want. What caught my eye this time around was a grilled veggie wrap in the grab-and-go bin at a place called Urban Tortilla in Terminal 3. Loaded with four or five different kinds of vegetables, it came in a spinach tortilla with guacamole on the side. Delicious. The only downside was that the underside of the wrap was slightly soggy, so it fell apart a little bit. It wasn’t a disaster. I had a fork. I also bought two beverages: the Sprite Zero to drink with my wrap, and a bottle of water for my next flight. The damage? $18.21 for all three items. My walk ended near a bookstore (which I had walked past two or three times), so I also bought a nonfiction book called “The Soul of the Octopus,” by Sy Montgomery, but I haven’t started it yet. After my walk, sitting down to eat my meal, perusing the bookstore and buying the book, and returning to my gate, I only had around fifteen minutes left before they started boarding. Perfect timing! Onwards to Detroit! If you follow me on Instagram, you may have seen my occasional post about my new favorite airplane pastime: drawing mazes, and leaving them behind for the next passenger. 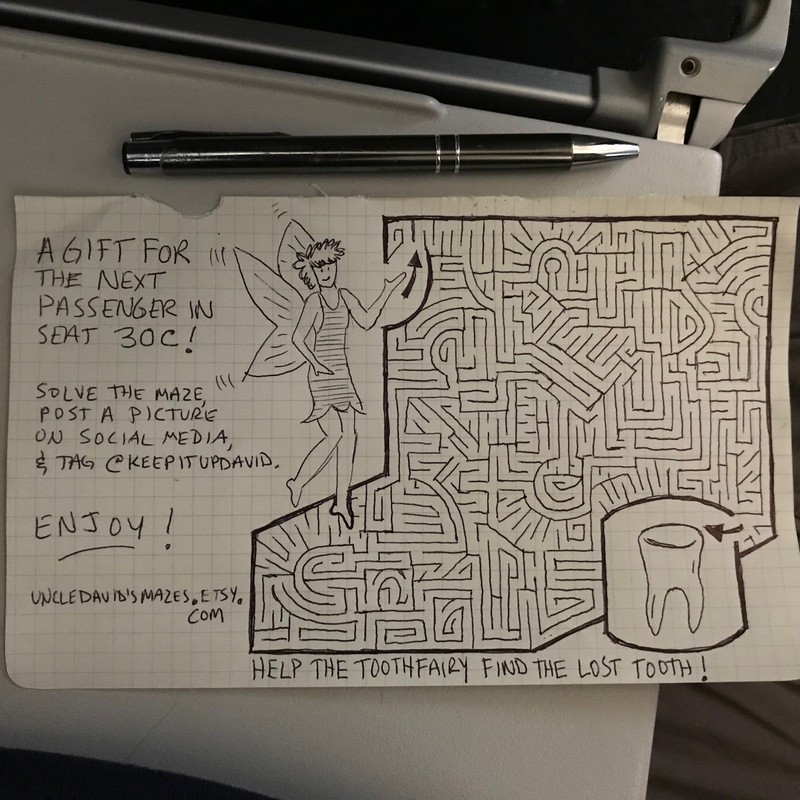 I tuck the maze into the seat pocket or in-flight magazine, and hope that eventually someone will reach out to me on social media, as per my instructions. It hasn’t happened yet, but hopefully it will one of these days! Here’s the maze I drew en route to Detroit. Check out more of my mazes here. 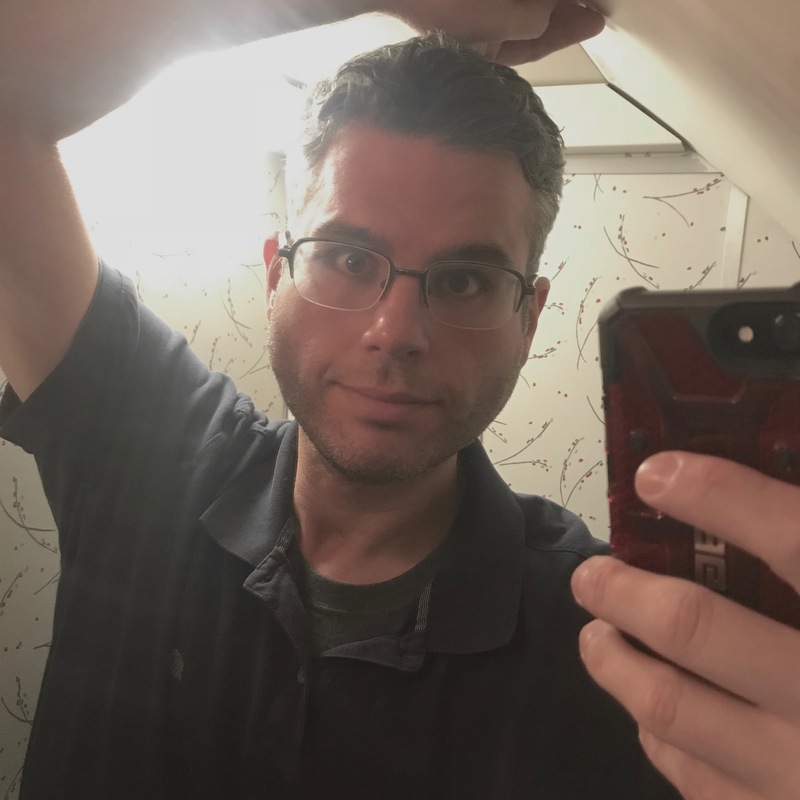 And the selfie I took in the airplane lavatory, because… why not? I’ll have a layover on the return flight to Los Angeles, and while I can’t recall, at the moment, how long it is, you better believe that I will spend that time wisely… by being active! This entry was posted on Tuesday, July 10th, 2018 at 6:23 pm and is filed under Uncategorized. You can follow any responses to this entry through the RSS 2.0 feed. You can leave a response, or trackback from your own site.